Mexico pledged to shore up security near its border with the United States after a peaceful march devolved into chaos when US agents fired tear gas into Mexico to stop some migrants who tried to breach the border. Mexico's Interior Ministry said it would immediately deport those who tried to "violently" enter the US from Tijuana. Meanwhile, Tijuana's municipal government said that more than three dozen migrants were arrested for disturbing the peace and other charges stemming from the march and what followed. The vast majority of the more than 5,000 Central American migrants who camped out for more than a week at a sports complex in Tijuana returned to their makeshift shelter to line up for food and recuperate from an unsettling afternoon. Lurbin Sarmiento, 26, of Copan, Honduras, walked back to the sports complex with her four-year-old daughter, shaken from what had unfolded a short time earlier at the border when US agents fired tear gas. "We ran, but the smoke always reached us and my daughter was choking," she said. American authorities shut down the nation's busiest border crossing at San Ysidro for several hours at the end of the Thanksgiving weekend. The situation devolved after the group began a peaceful march to appeal for the US to speed up processing of asylum claims for Central American migrants marooned in Tijuana. Mexican police had kept them from walking over a bridge leading to the Mexican port of entry, but the migrants pushed past officers to walk across the Tijuana River below the bridge. 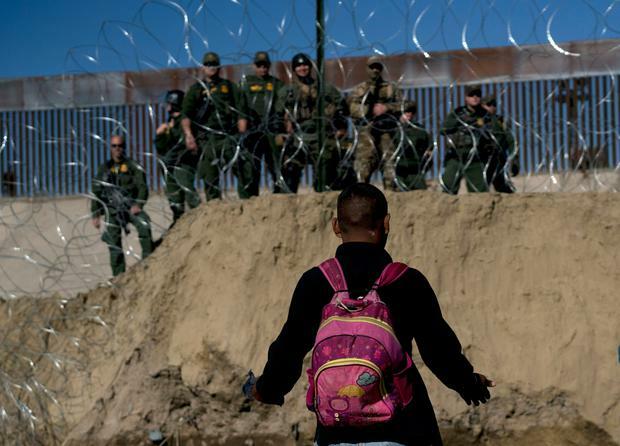 More police carrying plastic riot shields were on the other side, but migrants walked along the river to an area where only an earthen levee and concertina wire separated them from US Border Patrol agents. Children screamed and coughed. Fumes were carried by the wind towards people who were hundreds of feet away. "We ran, but when you run the gas asphyxiates you more," Ms Zuniga told the AP while cradling her three-year-old daughter Valery in her arms. Throughout the day, US Customs and Border Protection helicopters flew overhead, while US agents on foot watched beyond the wire fence in California. The Border Patrol office in San Diego said via Twitter that pedestrian crossings were suspended at the San Ysidro port of entry at both the East and West facilities. All northbound and southbound traffic was halted for several hours. US Homeland Security Secretary Kirstjen Nielsen said in a statement that US authorities would continue to have a "robust" presence along the border and that they would prosecute anyone who damaged federal property or violated US sovereignty. "DHS (Department of Homeland Security) will not tolerate this type of lawlessness and will not hesitate to shut down ports of entry for security and public safety reasons," she said. Tijuana Mayor Juan Manuel Gastelum declared a humanitarian crisis in his border city of 1.6m, which he says is struggling to accommodate the crush of migrants.